As The Link is working to improve its archives, several notable articles from before the shiny-computer-era will be uploaded to the Archives Blog. Today: the first ever article of The Link, detailing the decision to merge the two campus papers. This story was originally published in The Link on August 22, 1980. With this premiere issue of The Link, the changing face of Concordia is reflected. It is the product of a merger between Concordia’s former campus papers, Loyola News and The Georgian, with histories of fifty-six and forty-four years respectively. Talk of merging these newspapers began, logically enough, at the inception of the university. At first it was regarded as a ridiculous proposition, there being such apparent differences between the two papers and their long-established traditions. As the Concordia merger progressed, the animosity between campii mellowed enough to permit the unification of four of the student associations in 1979, leaving the two newspapers among the few remaining groups which were capable of merging but had not done so. It seemed to be more and more inevitable that the staffs of Loyola News and The Georgian, though not necessarily desirable. Over the winter holidays of 1979-1980, they first met to discuss the possibility of a merger. With a marked degree of wariness about their counterparts, tentative plans were worked out in some detail. Proposals were then taken back to the respective staffs to see if they were all acceptable. 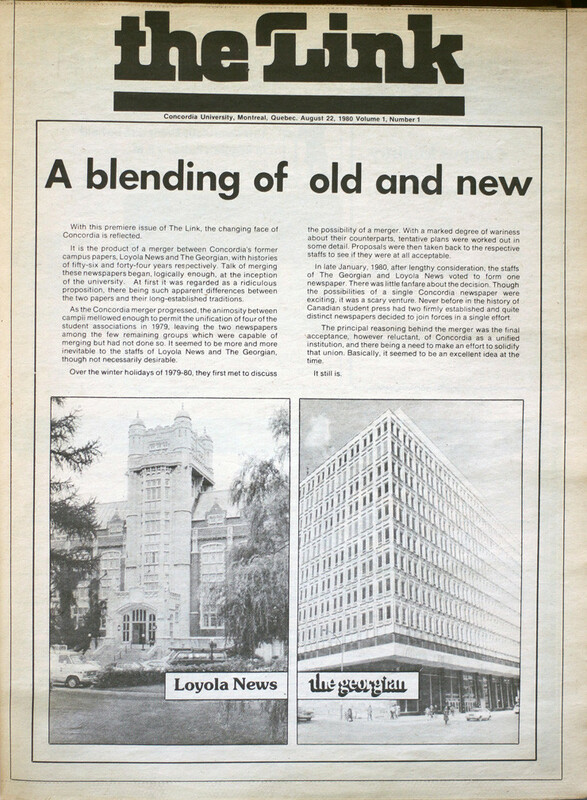 In late January, 1980, after lengthy considerations, the staffs of The Georgian and Loyola News voted to form one newspaper. There was little fanfare about the decision. Though the possibilities of a single Concordia newspaper were exciting, it was a scary venture. Never before in the history of Canadian student press had two firmly established and quite distinct newspapers decided to join forces in a single effort. The principal reasoning behind the merger was the final acceptance, however reluctant, of Concordia has a unified institution, and there being a need to make an effort to solidify that union. Basically, it seemed to be an excellent idea at the time.